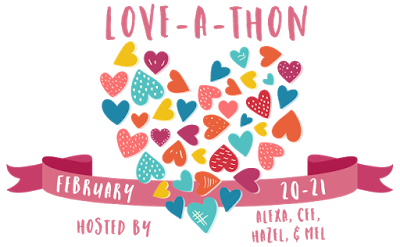 First of, what is the Love-A-Thon? According to The Daily Prophecy the Love-a-Thon is an event dedicated to spreading positivity and love. It’s time dedicated to visiting other bloggers/Instagrammers/BookTubers, leaving a comment or two, making new friends and fostering positivity among the members of our amazing community. I found her post for subscribing on her blog some time ago and I wanted to participate in this great event. So to let you all know who I am, I filled out a questionnaire. For more info that might not be in this questionnaire you can always check my book tags by clicking here. I will try to participate as much as possible. My boyfriend has a blog and when I kept talking to him about the books that I read, he suggested I started a blog too. My boyfriend and I came up with it together, because I really like analysing the characters in stories. Mostly YA, but if I find something that also interests me I will review that too. A lot of my coworkers checked out my blog when I mentioned it and are really happy with my reviews. Being able to talk about books! The Stonewylde series by Kit Berry. I have never heard anyone talk about it. Sylvie from the Stonewylde series by Kit Berry. This one is hard, because I am really happy with my boyfriend and not really looking for anyone else. Also I have something against looking at bookguys/girls as “boy/girlfriend material”. But I think I would pick Duval from the His Fair Assassin series by Robin LaFevers. Nothing, I really hate shopping! The His Fair Assassin series turned into a series of films. With Emma Watson as one of the main girls! *19. What would your dream library look like? Dark brown wooden shelfs and as big as possible! Haha. Consisting of all the books I can think off. Cassandra Clare to have a long and nice discussion about the new Shadowhunter TV series and what she has done to the Mortal Instrument series! This entry was posted in Other and tagged C.J. Redwine, Cassandra Clare, Kerstin Gier, Kit Berry, Leigh Bardugo, Love-A-Thon, Marissa Meyer, Ransom Riggs, Rick Yancey, Robin LaFevers, Sally Green, Sara Raasch, Stephenie Meyer, V.E. Schwab, Victoria Aveyard. Bookmark the permalink. I too require The Last Star and need ALL THE ANSWERS! Speaking of which, I still haven’t seen the film adaptation for T5W ahhhhhhh :(! Hello! I really enjoyed Red Queen and Snow Like Ashes. I hope you enjoy them as well when you get to them! I haven’t read the Shadow & Bone series but after reading Six of Crows, I NEED to read them 🙂 I should have put that on my own list. I hope you have a great weekend and a great Love-A-Thon experience! I love your name! It’s so unique and pretty. 🙂 I have been wanting to check out Red Queen and Half Bad for a while. I hope we both enjoy them! So glad you’ve joined in for this year’s Love-a-Thon, Iris! I LOVED The Shadow Queen. It’s an excellent fairytale retelling, and I do hope you get the chance to read it soon!! Jasper would be so good to have on an apocalypse squad! I think it’s so cute that your boyfriend convinced you to make a blog. OMG. It’s so cute. I cannot wait until The Last Star is finally out. I’m kind of sad that there aren’t going to be ARCs because I want the answers now! Right freaking now. Have you seen the movie version of The 5th Wave yet? I haven’t, but I probably will soon.